The Writivism Literary Initiative is pleased to announce the longlisted writers for the 2019 Short Story and Koffi Addo Creative Nonfiction Prizes. The Short Story Prize longlist is comprised of twelve stories selected from 387 entries by a team of three judges chaired by Ugandan novelist and short story writer, Jennifer Nansubuga Makumbi. The other judges are Zimbabwean writer and editor, Emmanuel Sigauke and Ghanaian publisher, blogger and activist, Kinna Likimani. The Koffi Addo Prize for Creative Nonfiction longlist is comprised of eight stories selected from 117 entries by a team of three judges chaired by Ghanaian novelist Ayesha Harruna Attah. The other judges are South African novelist, memoirist, poet and short story writer, Karen Jennings and Kenyan academic Dr. Christopher Ouma. For the first time, we have writers from Liberia and Lesotho on the longlists, and also have a writer, Frances Ogamba, appearing on both longlists. Abdulrahman ‘Abu Amirah’ Ndegwa is a Mombasa-based creative writer, AMLA (Arts Managers & Literary Activists) Fellow, AWT (African Writers Trust) Publishing Fellow, convenor of the Swahili Literary Festival and Founder & Managing Editor of Hekaya Arts Initiative, a literary and cultural production and publishing platform for Coastal narratives. He has been published twice by Writivism and participated in the Writivism Online Creative Writing Mentorship Program, MMF Creative Writing Workshop, Kwani? Trust Creative Writing Workshop and Storymoja Short Story Online course. His traveling fiction project (writers from the entire Swahili Coast participating in one flowing story passed from one writer to the other) under Hekaya Arts initiative won the AWT Seed Fund and will be Hekaya’s publishing pilot project. The project is an attempt at connecting writers from the entire Swahili coast through one story. Abu Amirah is also a student of Psychology and currently working on polishing his first short story collection and a Young Adult novel. This is his second attempt at creative nonfiction, the first one, Rock Bottom, published on Kalahari Review. Charles Dorme Cooper is an entrepreneur and creative from Liberia, West Africa. Among other things, he’s the father of a brilliant boy named Xavier, and co-founder of Cookshop.biz, Liberia’s first dot-com company. Mr. Cooper is a Global Entrepreneurship Summit delegate and a Branson Entrepreneurship Scholar. He attended the Maryland Institute College of Art in Baltimore and has degrees in Graphic Design and Visual Communication. When he was young, Mr. Cooper traveled as a refugee to the USA, where he learned to miss being home. He now lives in Monrovia. Eugene Yakubu is a storyteller and cultural critic who lives and writes from Nigeria. He loves coffee and books and the twilight glow of the African sky. He spends his time staring at the world from his window, living in his soul and wondering where the sun goes to at night, as should all right thinking people do. He is best known for writing stories that will guarantee him a time in jail, essays and non-fiction on non-normative identities, fluid gender roles and human rights. He is running a graduate research on Queer Studies and LGBTI narratives in African literature at Ahmadu Bello University, Zaria. His nonfiction This Hell of a Body has been shortlisted for the Gerald Kraak Award 2019. If he isn’t writing a review, he is probably dreaming of sitting on the same table with Toni Morrison and Obama and eating cake. 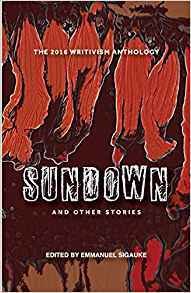 Frances Ogamba’s stories appear in Afridiaspora and Writivism digital mini anthology, Dwartonline and Ynaija websites, and on Enkare Review. She is a workshop alumnus of Writivism 2016, Ake fiction 2016, and Winter Tangerine 2016. She lives in Port Harcourt, Nigeria. Nwankwo Ugochukwu Evans is a writer, evangelist, scientist, and motivational speaker of Igbo descent. His short story was shortlisted for the 2016 Rusty Scythe International Award, and the 2017 Writivism Koffi Addo prize for creative nonfiction. His works have appeared in cfwriterz.com, Authors Without Boundaries, and soon to appear in the Spring edition of Active Muse collection, an Indian journal of Literature, poetry and art. He enjoys the outdoors, and he plans on changing the world, one story at a time. He is currently working on his debut novel. Samuel Arum is a book lover. He hopes to read and write more stories that explore mental health and the intricacies of the human mind. Currently, he works as a physiotherapist in Nigeria. He was longlisted for the 2016 Awele Creative Trust Prize and has been published by the Kalahari Review. Som Oluwatobi August Adedayo is currently studying English Language at Obafemi Awolowo University, Ile-Ife, Nigeria, where through his notepad’s lens he loves to see the flowers bloom. He is a co-founder of the photoblog The People’s Journal which very soon will commence online publishing. He had been shortlisted for Eyitayo Adeosun Memorial Writing Competition. He tweets and poses on instagram both as @som__august. Chiamaka Omireh is a Nigerian up and coming writer. Her love for literature started at a very young age before she started writing her own stories in her head. The zeal to actually put the ideas in her head down on paper started at a later age. Her short story Understanding Grandma was shortlisted for African book club short story competition 2018. She is currently studying Pharmacy in the university of Port Harcourt, Nigeria and in her free time, she travels in her mind, creating stories. Gladwell Pamba is a trained teacher of English and literature. She currently works in a leading telecommunication company in Kenya. She believes that everything surrounding her is a story, a scene, a moment that needs to be captured on paper. She is Kenyan and runs a creative fiction and non fiction blog called chingano.com. She is a recipient of Makena Onjerika Fiction Writing Workshop 2018 cohort. Godwin Uche Uwadilachi is a graduate of Accounting currently undergoing his one-year mandatory National Youth Service in a Nigerian Polytechnic. An unrepentant lover of education, he also believes that African Literature is the gateway to another literary era yet unknown and tries the best he can to contribute his quota. His stories have appeared on the Kalahari Review, African Writer and elsewhere. Ifeoma Nnewuihe is a Nigerian writer living and working in Lagos, Nigeria. She has a Bachelor Of Arts Degree in English and Literature from the University of Lagos. A collection of her poems have been published on The Kalahari Review and she is the 2018 winner of the Paula Chinwe Okafor Prize for Creative Non-Fiction. In her spare time, Ifeoma makes mixed media art. She will eat 200 mangoes if you let her. Onyango Olual is a 28-year-old Kenyan High School Teacher of English and Literature. He is a literary and cultural critic who has had his opinions periodically published by Kenya’s Saturday Nation, the nation’s largest newspaper. He is working on his first novel. Peace Mbengei was born and raised in Nairobi, Kenya. She is a scriptwriter, playwright, fiction writer and medical doctor. She is an avid reader of African fiction. She caught the writing bug when she was a little girl. Unfortunately, they are yet to find a cure and she hopes they never do. ‘Losing Papa’ is her debut short story. Phillip Leteka grew up in Maseru, Lesotho. He obtained an MFA in Film at the Rochester Institute of Technology in New York, as a Fulbright Scholar, and a BA in Journalism at Limkokwing University of Creative Technology. Precious Colette Kemigisha is an editor and writer of poetry, short stories, and plays. She is lifelong student of literature and creative writing up to postgraduate level and loves to explore the themes of race, female identity, and the freedom of self-expression. She is currently working as an Editor and Creative Writing tutor, passionately teaching the craft to the next generation of writers. Her stories have appeared in various anthologies including a soon-to-be released collection of YA stories selected from African writers on the continent. She is currently working on a full-length, semi-autobiographical work of creative non-fiction to be published in 2019. Resoketswe Manenzhe is a PhD candidate with the chemical engineering department at the University of Cape Town; this, after receiving her master’s degree with distinction. Starting in 2015, her poems and short stories have appeared in several online magazines and journals, and in 2017, two of her poems were shortlisted for the Sol Plaatje EU Poetry Anthology, and subsequently published in the anthology of selected poems. She currently lives in Cape Town, South Africa, but she’s been known to occasionally wander to the Arctic region, where she fell in love with blueberry pie and a small rural town whose name is difficult to pronounce. Temitope Owolabi is an editor and writer whose work explores the effects of loss and the delicateness of love in human interconnection. She was one of the 25 selected for the Farafina Creative Writing Workshop in 2015. Her short fiction has featured in journals online and her memoir/essay was recently published by The Book Banque. She’s a reader and collector of books. Because she hates the narrative that Africans do not read, she runs a book club for kids age 3-6 in her spare time. Her first book is in part progress, part chaos. Vuyelwa Maluleke is a Performance Poet, Scriptwriter and Actor, who holds a Bachelor of Arts in Dramatic Arts from the University of Witwatersrand. She was shortlisted for the Brunel University African Poetry Prize in 2014, and is the author of the chapbook “THINGS WE LOST IN THE FIRE”. A slam champion of the Word and Sound 2015 Poetry league competition with an essay in the recent publication of Selves: An Afro Anthology of creative non-fiction 2018. Maluleke, who is the Co-creator of the choreopoem NO ONE WANTS A BLACK WOMAN WITH A MOUTH (2016) describes her work as an attempt to archive, retell, and give names to the personal experience of Blackness, Girlhood, and Womanhood. She is currently a Masters in Creative Writing candidate at the University previously known as Rhodes.